In college, there are three kinds of classes. First, there’s the blow-off classes, where 80 percent of your grade comes from fill-in-the-blank worksheets. To pass, all you really have to do is show up. Then, there are the classes taught by “real hardasses.” These classes kept you up well past midnight, flipping frenetically through flashcards, chugging coffee and energy drinks. Though one class is incredibly easy, and the other is mind-numbingly difficult, they are actually two sides of the same coin. They both rely on worksheets, textbooks, lectures, essay questions, and culminate in the undergraduate cycle of doom: cram, regurgitate, forget, repeat. The third kind of class, however, sidesteps the whole messy system. I was lucky to have a few classes like that, but one stands out in particular: Honors Shakespeare. The professor was intelligent, and very well-read. Beyond her academic credentials, though, she was an inspiring teacher. In her classroom, I never felt lectured to, or really even “taught.” But her teaching left me passionate, fired-up, and with a new appreciation for the classic plays and the world they came from. Instead of forcing the information down our throats, or spoon-feeding it to us, this professor handed us the utensils and let us eat for ourselves. Many writers fear becoming the “hardass” professor. I know I do. We want our writing to be digestible, not abstruse. But, in purging our content of any whiff of pedantry, many of us fall too hard on the other side of the spectrum. 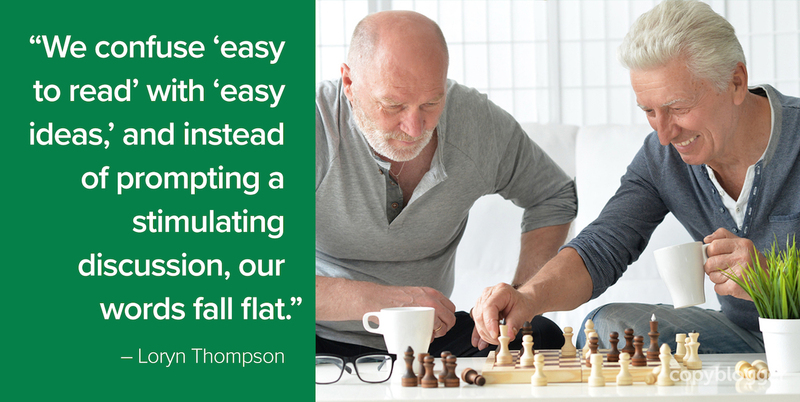 We confuse “easy to read” with “easy ideas,” and instead of prompting a stimulating, engaging discussion, our words fall flat … and fall out of our readers’ heads as quickly as Statistics 101. In marketing, there’s an idea that you shouldn’t make your potential customers work for anything. And that’s true in many ways. Your website should be fast, secure, and intuitive. The mistake is believing that you shouldn’t make any of your potential customers work for anything … ever. Sometimes, people need to be challenged. In fact, sometimes people like being challenged. Psychologist Mihaly Csikszentmihalyi knows this; it’s the foundation of his revolutionary 1990 book, Flow. You’ve likely heard of “flow.” It’s the state of deep concentration we feel when we are engaged in a purposeful and enjoyable task. Rock climbers feel flow when they climb a challenging peak, chess masters feel flow when they play a worthy opponent, motorcyclists feel flow when they’re following the lines on a graceful curve. You know who else feels flow? Readers. Csikszentmihalyi even cites it as a quintessential example of a flow activity. It has to have rules or require skills that must be learned. It must provide clear goals and feedback. We have to be able to control the outcome. In short, flow activities have to be challenging — but they can’t just be any kind of challenging. To achieve flow, the challenge has to be appropriate for the participant’s skills. If the activity is not challenging enough, we get bored. If the activity is too challenging, we grow frustrated. Either way, the result is disinterest. Pleasure is fleeting: We don’t have to be engaged to find something amusing or entertaining. But to have a truly enjoyable experience, we have to be invested. To be invested, we must first be challenged. When these stars align — when we find an appropriate challenge and become invested — magic happens. We see things differently, we learn something new about ourselves, we find the world around us transformed. My Shakespeare professor knew how to engage her students — how to gauge their skill level and provide appropriate challenges. And she knew that if she did it well, we would leave her class transformed. So, how do you write in ways that engage your readers and leave them transformed? That’s why you want to avoid a complicated checkout process or website that isn’t mobile-optimized. In those situations, the challenges you’ve created for your potential customers are completely irrelevant to their goals. User-experience issues are so frustrating because they’re outside the realm of the intended goal and will actually hinder a flow experience rather than create it. In the same vein, poor grammar and opaque language can be viewed as the “UX issues” of reading, and will have the same effect on flow. If you fill your content with trivial information — essentially making it harder to follow your point — readers will also grow frustrated and give up. An engaging writer cuts trivial information ruthlessly, so that every sentence contributes to the value of the whole piece of content. Creating nontrivial challenges is only half the battle. To ensure your readers will find your content engaging, you have to make sure the challenges you present are well-suited to their skill level. One way to achieve that is to become a master content marketing strategist, just like my Shakespeare professor was a master educator. A thorough understanding and deep empathy for your intended audience will allow you to gauge exactly what you should say to spark their interest. Here’s a secret: sometimes, the best way to write engaging, challenging material is to write while you’re still learning. I know it sounds counterintuitive, but when you’re still learning you’re more sensitive to what’s interesting and would appeal to other learners. And, your passion can bring out the best in your writing. I’m not saying you need to be a true beginner without any knowledge of your topic. But if you keep a beginner’s mind, you’re much more likely to strike the perfect balance, and find those appropriate challenges that will capture your readers’ imaginations. I want to leave you with one last thing to think about as you embark on your new journey to write more challenging content. You probably have goals for your content: you want it to persuade, to inform, to spread awareness, to sell. If your writing is rewarding for readers, you’ll be on your way to achieving your other content marketing goals. Loryn Cole is Copyblogger's Data Analyst. She also writes about her love for motorcycles on her blog, RIDEWELL. Want superior business results? Start creating superior content. Thank you for this read Loryn! I’ve been struggling with actually generating some meatier content. I’ve only just started writing and blogging, and I feel as though most of my posts are fluff. I was particularly encouraged when you advised writing a more challenging piece while still learning about the subject. Much as I have wanted to write weightier pieces, I’ve felt that I am not able to because I am not yet a master in the topic. I’m excited to hear that it is ok for me to start writing more now! Thank you! “An engaging writer cuts trivial information ruthlessly, so that every sentence contributes to the value of the whole piece of content.” a very interesting quote from your writing. Great stuff Loryn. Empathy. So happy you used that word. Be empathetic and compassionate. Feel your audience. Or feel how they feel. See through their eyes. No problems engaging readers if you see issues from their perspective because you will know exactly what to write and how to write it to induce chats and to keep readers glued to the screen. You’ve got it exactly, Ryan! I read a great quote once to the effect that one of the best ways to really understand a topic is to write about it. Makes perfect sense and what you’ll find writing about a topic (especially ‘how-to’ type content), is that it really clarifies your understanding of the topic. Especially after you read your first draft and you begin to realise what’s missing, what needs to be reworded or restructured, and so on. Plus, writing frequently also makes you a better writer. Added bonus! Interesting thought. It’s good to remind ourselves that we don’t want to dumb down our content, or make it inaccessible. Balance is always good. I’m curious though, what did your Shakespeare professor do to create flow? You say she gave you utensils, and knew how to meet or engage different students. I think the utensils in particular is a great metaphor but I’m curious to how she did that? As a former college professor (philosophy), I have to point out that while that Shakespeare professor might have been perfect for you, some other students might have rated her poorly. For me when I was teaching, and now when I am writing or marketing, the ultimate compliment was or is: “You made me think.” But many students and readers most definitely do NOT want to think. They’d rather be told what to think. So it’s wise to remember that In our world, it takes all kinds. No one way of writing or working suits every reader, and the readers who want something different aren’t wrong; they’re merely different. Wonderful content, and also challenging! I love the tip about writing while you’re learning. It’s easy to forget how confusing or difficult was to learn something if we went through that a long time ago, and that makes it hard to relate to the readers. That’s going to change how I approach some of my content for sure! Although I’ve long learned to expect great content on the Copyblogger blog in the 12 years I’ve been a reader, some stand out. Wish I had written it. I love this! I write about folklore so I don’t necessarily have something for readers to learn to do when they’re reading…but I still want them to walk away with new information that they’ll remember. And I’d like them to feel entertained while they do so. I’m going to try and focus on creating a story (or flow) in my next article to see what difference it makes! Certainly! This tactic definitely applies to learning “about” as well as learning “to do.” Storytelling is a great way to create flow — all I really mean by “creating challenges” is simply giving your readers a chance to stretch their minds 🙂 Hope it goes well! Love this post. I feel this tension regularly as a marketing manager for an academic imprint. This definitely made me think, Loryn. Thank you. I’m often hesitant to write while I’m learning because I find it so much harder to articulate concepts in my own words. Also so much of my blog is based on personal experiences. This will really make me rethink how to approach it. That said, I’m finding it difficult to make this concept concrete in terms of how to shift my approach. It would be helpful to have more concrete examples or perhaps to get feedback on where I’m being too simple or where I’m being too complex. Perhaps that can be a webinar topic? A webinar might not be a bad idea! I’d like to think the post itself is a good example of how to execute the strategy — I tried to write to readers as equals, and expand their horizons by taking them on a mental journey alongside me. And, having to articulate concepts in your own words is exactly why it’s so useful to write about something as you’re learning — not only do you learn the topic better, but the phrases that make the subject “click” for you are likely going to work for your readers as well. Hope it goes well, Renee! This article's comments are closed. Get free access to proven marketing training.